"Why on earth would anyone want to adopt a rescue dog?" "Top 10 Reasons You Should Consider a Rescue Dog"
In a Word-Housebroken. With most family members gone during the work week for 8 hours or more, housetraining a puppy and its small bladder can take awhile. Puppies need a consistent schedule with frequent opportunities to eliminate where you want them to. They can't wait for the boss to finish his meeting or the kids to come home from after school activities. An older dog can "hold it" much more reliably for longer time periods, and usually the Rescue has him housebroken before he is adopted. Intact Underwear. With a chewy puppy, you can count on at least 10 mismatched pairs of socks and a variety of unmentionables rendered to the "rag bag" before he cuts every tooth. and don't even think about shoes! also, you can expect holes in your carpet (along with the urine stains), pages missing from books, stuffing exposed from couches, and at least one dead remote control. no matter how well you watch them, it will happen--this is a puppy's job! an older dog can usually have the run of the house without destroying it. A Good Night's Sleep.Forget the alarm clocks and hot water bottles, a puppy can be very demanding at 2am and 4am and 6am. He misses his littermates, and that stuffed animal will not make a puppy pile with him. If you have children, you've been there and done that. How about a little peace and quiet? How about an older rescue dog? Finish the Newspaper. With a puppy running amok in your house, do you think you will be able to relax when you get home from work? Do you think your kids will really feed him, clean up the messes, take him for a walk in the pouring rain every hour to get him housetrained? With an adult dog, it will only be the kids running amok, because your dog will be sitting calmly next to you, while your workday stress flows away and your blood pressure lowers as you pet him. Easier Vet Trips. Those puppies need their series of puppy shots and fecals, then their rabies shot, then a trip to be altered, maybe an emergency trip or two if they've chewed something dangerous. Those puppy visits can add up (on top of what you paid for the dog!). Your donation to the rescue when adopting an older pup should get you a dog with all shots current, already altered, heartworm negative and on preventative at the minimum. Unscarred Children (and Adults). When the puppy isn't teething on your possessions, he will be teething on your children and yourself. Rescues routinely get calls from panicked parents who are sure their dog is biting the children. Since biting implies hostile intent and would be a consideration whether to accept a "give-up", Rescue Groups ask questions and usually find out the dog is being nippy. Parents are often too emotional to see the difference; but a growing puppy is going to put everything from food to clothes to hands in their mouths, and as they get older and bigger it definitely hurts (and will get worse, if they aren't being corrected properly.) Most older dogs have "been there, done that, moved on." Matchmaker Make Me a Match. Puppy love is often no more than an attachment to a look or a color. It is not much of a basis on which to make a decision that will hopefully last 15+ years. While that puppy may have been the cutest of the litter; he may grow up to be superactive (when what you wanted was a couch buddy); she may be a couch princess (when what you wanted was a tireless hiking companion); he may want to spend every waking moment in the water (while you're a landlubber); or she may want to be an only child (while you are intending to have kids or more animals). Pet mis-matches are one of the top reasons Rescues get "give-up" phone calls. Good rescues do extensive evaluating of both their dogs and their applicants to be sure that both dog and family will be happy with each other until death do them part. Bond-Rescue Dog Bond. Dogs who have been uprooted from their happy homes or have not had the best start in life are more likely to bond very completely and deeply with their new people. Those who have lost their families through death, divorce or lifestyle change go through a terrible mourning process. But, once attached to a new loving family, they seem to want to please as much as possible to make sure they are never homeless again. Those dogs that are just learning about the good life and good people seem to bond even deeper. They know what life on the streets, life on the end of a chain, or worse is all about, and they revel and blossom in a nurturing, loving environment. Most rescues make exceptionally affectionate and attentive pets and extremely loyal companions. Unfortunately, many folks think dogs that end up in rescue are all genetically and behaviorally inferior. But, it is not uncommon for Rescue to get $500 dogs that have either outlived their usefulness or their novelty with impulsive owners who considered their dog a possession rather than a friend or member of the family; or simply did not really consider the time, effort and expense needed to be a dog owner. Not all breeders will accept "returns", so choices for giving up dogs can be limited to animal welfare organizations, such as Rescues, or the owners trying to place their own dogs. Good Rescues will evaluate the dog before accepting him/her (medically, behaviorally, and for breed confirmation), rehabilitate if necessary, and adopt the animal only when he/she is ready and to a home that matches and is realistic about the commitment necessary to provide the dog with the best home possible. Choosing a rescue dog over a purchased pup will not solve the pet overpopulation problem (only responsible pet owners and breeders can do that), but it does give many of them a chance they otherwise would not have. But, beyond doing a "good deed", adopting a rescue dog can be the best decision and addition to the family you ever made. Rescue a dog and get a devoted friend for life. 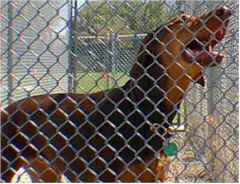 Written by Mary Clark at LABRADOR RETRIEVER RESCUE, INC.
document as long as LRR, Inc at http://www.lrr.org/ is credited.